Bride and groom kiss in the aisle of the spectacular Saint Andrew the Apostle Parish in Calumet City. The first thing I noticed when I walked into 8.14 Hair Studio was the bond between bride Jessica and her mom. Although I was somewhat of a stranger to them, they never seemed nervous or put off when they sat and discussed the plans of the day or looked over books on hair styles. I really enjoyed their sense of fun and it was an honor to be invited to capture it all for Jess and Adam's big day. And what a day it was - the cold and the snow would not damper spirits. This was truly a fun wedding. As the sign in the salon says "Enjoy life. It's not a dress rehearsal." Mother and daughter share a laugh on wedding day. Enjoy life. It's not a dress rehearsal. Tender moment between mom and daughter as the bride gets into her wedding dress. For the brides to be out there who often wonder what the guys do as they get ready for a wedding, well let me tell you. if there is a pool table around it's going to get played. More than likely if there's a TV close by, it will be tuned into ESPN. Groomsman gets ready to sink a solid ball in a game of pool on wedding day. Dad watches ESPN during the morning of his daughter's wedding. Seriously though, I could not have asked for a better group of guys. If I didn't have a job to do this day, I could have easily played a round of eight ball with them although I think I would have certainly lost. As you can see above, Dad is deep in thought about wedding preparations. College basketball just happened to be on in the background!! Adam did get help from his brother Kevin in between his turn at the pool table. Soon he would be awaiting Jessica at the altar of Saint Andrew's Parish. The best man helps out the groom with his tie the morning of the wedding. The guys toast the groom on wedding day. The best way to describe Saint Andrew the Apostle Parish in Calumet City, Illinois is "majestic". It's one of the largest Catholic churches in the area and a joy to photograph. As Jessica walked down the aisle with her Dad, I shot wide to capture the grandness of the beautiful building while my associate photographer took close ups. Father and daughter walk down the aisle at Saint Andrew the Apostle Parish. 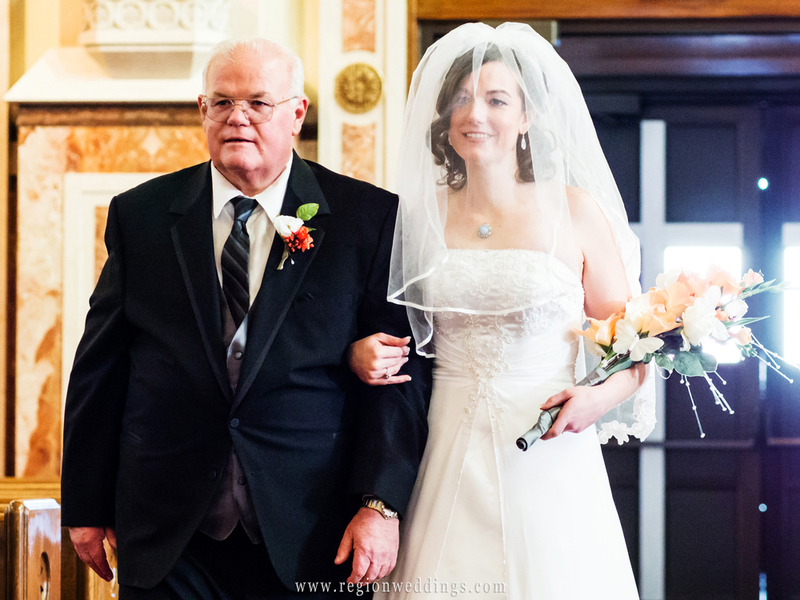 Dad proudly walks his daughter down the aisle at a Catholic wedding in Chicago. Father Jack injected a lot of humor into the ceremony as we captured the moments as they happened. In the shots below I was able to capture the view from the altar showing the joy in the faces of the bride and groom as well as see the wonderful church from their perspective. A wide angle view from the altar of Saint Andrew the Apostle Parish. The couple reacts with smiles as their priest performs their Catholic wedding ceremony. A candid moment between the bride and groom at the altar of Saint Andrew the Apostle Parish. 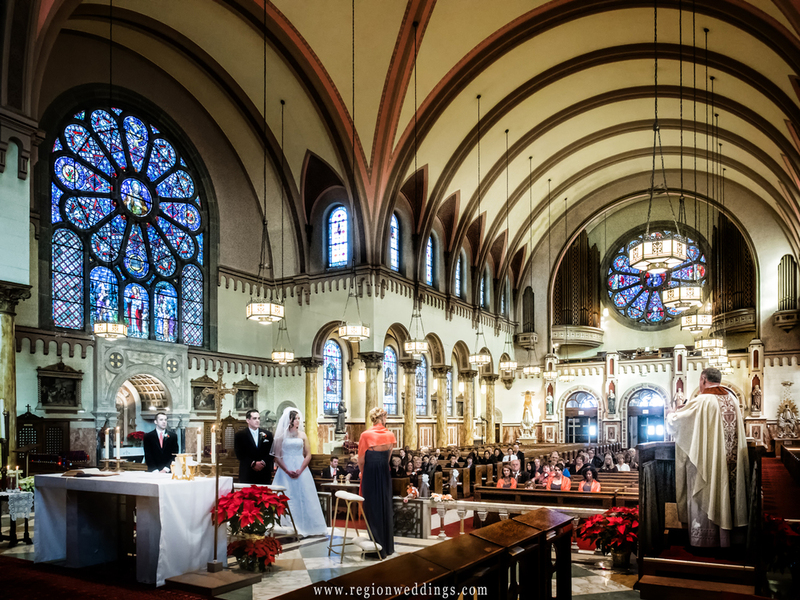 Bride and groom gaze at each other in the balcony overlooking the majestic church. After the ceremony we took family photos and then set out do something fun and unique. Jessica was an all star Highland HS and Purdue basketball player. With this in mind, we put her at the free throw line along with her wedding party ready to rebound. Do you think she made the shot or did wedding day pressure make her shoot an air ball?!! The bride shoots free throws at Lincoln Center gym on her wedding day. The bride makes the shot as the wedding party gets ready to rebound. The fun continued on from there as we made our way to Great Oaks Banquet Hall in Cedar Lake, Indiana for the reception. The groom does a strip tease before taking the garter off to toss to all the single men. The best man high fives the groom after catching the garter. The ring bearer helps out during the dollar dance at Great Oaks Banquet Hall in Cedar Lake, Indiana. It was a great moment when Kevin, the brother of the groom and best man caught the garter and they high fived on the dance floor. This was just one of many fun moments at Adam and Jessica's wedding that took the bite out of winter. The warm spirits of family and friends was all that was needed. I hope you have enjoyed this sneak peek. For more image updates, please follow this blog or the Region Weddings Facebook page. Much more to come! !